An Israeli-operated quarry in the industrial area of the Ma'ale Adumim settlement in the West Bank, just outside of Jerusalem. Credit: Jillian Kestler-D’Amours/IPS. JERUSALEM, Sep 3 2012 (IPS) - By mining natural resources from the occupied Palestinian territories for its own economic purposes, Israel is committing the war crime of pillage in the Dead Sea area, according to a report released Monday by Palestinian human rights group Al Haq. “Israel is openly in violation of its obligations as an Occupying Power in the (occupied Palestinian territories), because it is encouraging and facilitating the exploitation of Palestinian natural resources and actively assisting their pillaging by private actors,” said the Al Haq report, titled ‘Pillage of the Dead Sea: Israel’s Unlawful Exploitation of Natural Resources in the Occupied Palestinian Territory’. Criminal responsibility for the crime of pillage does not only extend to the state of Israel, but can also be applied to individuals, namely Israeli settlers who benefit from the extraction of resources from the Dead Sea, Al Haq said. “Although settlers and companies involved in the exploitation of the natural resources of the Dead Sea are mainly encouraged to do so by the State of Israel, they cannot ignore that such resources are considered Palestinian under international law. This should be sufficient to substantiate the ‘mental element’ of the crime of pillage, thus allowing for some Israeli settlers to be considered as the direct perpetrators of that crime,” the report stated. Israel has maintained that numerous covenants of international humanitarian law do not apply to the occupied Palestinian territories since these areas are not under Israel’s jurisdiction. Recently, an Israeli government-appointed committee, known as the Levy Committee, also ruled that Israel is not an occupying power and that therefore, Israeli settlements in the West Bank are legal. Recently, the South African government stated that it wouldn’t import goods produced in the occupied West Bank that are marked as Israeli-made. The United Church of Canada, the country’s largest Protestant church, also passed a similar boycott resolution against all settlement products. The consequences of Israel’s exploitation of Palestinian resources don’t end at the Dead Sea, however. In 2009, Israeli human rights group Yesh Din submitted a petition the Israeli Supreme Court challenging the legality of Israeli quarrying activities taking place throughout the West Bank. The court rejected the group’s petition on the basis that the rules of occupation change when an occupation is long-term: the authorities of an occupying power can expand, while the restrictions against it are reduced in a state of long-term occupation, the court argued. 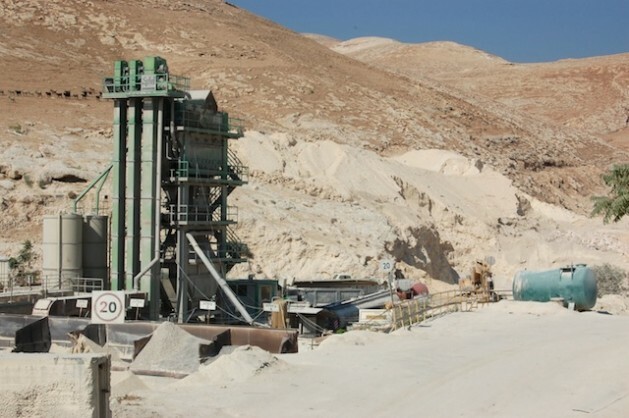 “Quarrying natural resources in an occupied territory for the economic benefit of the occupying state is pillage, and the court’s reasoning that a long-term occupation should be treated differently cannot legalise an economic activity that harms the occupied residents,” said Yesh Din legal advisor, Attorney Michael Sfard, in a press release announcing the court’s decision. The High Court subsequently stated that its ruling “does not constitute a precedent and was given in the concrete circumstances of the petition.” The decision, therefore, shouldn’t be applied to other cases of Israeli exploitation of Palestinian resources, a representative of Yesh Din told IPS. Still, according to Sarit Michaeli, spokesperson of Btselem, the Israeli information centre for human rights in the Occupied Territories, the High Court has consistently refused to rule on the legality of Israeli settlements, which it claimed is an issue that needs to be resolved politically. “The building of settlements requires taking over land, so in a sense it’s the most important violation of this prohibition on the use of the resources of the occupied area for the benefit of the occupying power,” Michaeli told IPS. She said that Israel continues to “flout international law” in its exploitation of Palestinian resources, including, in particular, water, land and underground resources.